Set of 5. Four girlfriends wearing stylish sunglasses! "You're so cool!" "You're spec-tacular!" "Happy birthday you're gonna need these" with sunglasses icon. Birthday cake crammed with candles. A cling rubber stamp from Stamping Bella featuring a girl and the sentiment "True friendship is a plant of slow growth". Friendship themed clear stamps from Picket Fence Studios featuring the sentiments "I have a great idea but it does involve a designated driver", "Let's be friends", "You deserve this card", "I have a secret that's only for you and me", and more. Unique, beautiful and creative stamps designed by Nicole Petersen. Use with paints and inks. Perfect for card making, journaling, scrapbooking, and mixed media. Satisfy your sweet tooth with this cute set of desserts and matching sentiments. This set is perfect for Valentine's Day, friendship cards, or any time you're feeling like a treat! Approximate size: frozen yogurt: 1" x 1 3/8", flan: 1" x 7/8", donut: 1" x 1", ice cream sandwich: 1" x 7/8", cupcake: 1" x 7/8", plate: 1 1/4" x 1/2". Our burgeoning bunny collection has taken us from the beach to bedtime and now they're taking us on a shopping spree! Hop into bunny's sweet little convertible and head to town to shop your heart out. This trio of bunnies is accessorized by scene-setting elements, extra shopping bags and an assortment of friendship-celebrating sentiments. This 17 piece set includes: bunnies (3) 1 1/4" x 1 5/8", 1 5/16" x 2", 1 5/8" x 2 1/8", flowers (3) 5/16" x 1/2", 1/4" x 7/16", 3/16" x 3/8", tree 1 1/2" x 1 5/8", bow 3/8" x 3/16", heart 1/4" x 1/4", butterfly 7/16" x 3/8", bags 9/16" x 1/2", A Friend Is the Best Accessory 3 3/8" x 3/16", To Somebunny Very Special 3 1/8" x 3/16", For an Ear-resistable Friend 3 1/8" x 1/4", To My Very Sweet Friend 2 3/4" x 3/16", Happy Birthday 1 7/8" x 3/16", hop Til You Drop 2" x 3/16". Clear stamp sets include the name of the set on the sticker for easy identification. Our clear stamps and Die-namics are made in the USA. "When times are tough, friends are your umbrella". Part of the Girlfriends Collection from Art Impressions. Friendship themed Cling Stamp from Stamping Bella featuring a hot air balloon and the sentiment "True friends are never apart, maybe in distance but never in heart". Friendship themed cling rubber stamp from Stamping Bella featuring the sentiment "Sometimes I wonder how you put up with me. Then I remember that I put up with you. So we're even". Cling Stamp from Impression Obsession featuring Victorian Friends. These furry little forest creatures will make the sweetest addition to your cards, tags, and other projects. 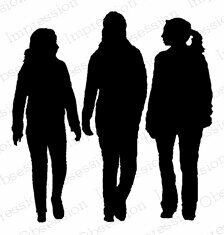 They are an ideal size for combining a number of them into a single scene - either with die cuts or by creating a crowd with masking - and will add instant charm with their endearing poses and expressions. The accompanying sentiments are a classic collection of phrases appropriate for any number of occasions. This 14 piece set includes: Side-facing squirrel 1 3/4" x 1 5/16", Front-facing squirrel 1 5/16" x 1 5/16", Hedgehog 7/8" x 11/16", Bunny 1 3/8" x 1 5/8", Fox 2" x 1 5/8", You're One of My Sweetest Friends 3 1/8" x 1/4", Your Kindness Touched My Heart 3" x 1/4", Hope Your Day Is Full of Joy 2 1/2" x 1/4", Thankful for You 1 1/2" x 3/16", Thinking of You 1 3/8" x 3/16", You're Special to Me 1 13/16" x 1/4", Feel Better 1" x 3/16", Miss You 3/4" x 3/16", Hello 7/16" x 3/16". "We may not have it all together, but together we have it all". Part of the Girlfriends Collection from Art Impressions. Artist Laurel Burch strove to create images that would remind people of the ongoing world of the spirit. Magical, beautiful images that will give you the freedom of expression to color and enjoy. Image measures 2.75" X 2.75". Features 2 horses and the sentiment "a very special bond between very special friends". Useful messages, in a funky label style, along with fun-fair images. Includes "Friends", "Together", "Find beauty in ordinary things", "Thanks", "Love to laugh", "Smile", and "Be Happy". Hero Arts clear design stamps peel off their backing and stick to acrylic blocks for easy positioning. Mix and match the designs, then put them away for another time. Made by us in the USA from genuine photo polymer. Clear stamps featuring flowers and the sentiments "Thank You", "Beautiful Soul", and "Simple sweet acts of friendship are the most important". Includes 5 individual stamps. Designs by Sheena Douglass. Acid & lignin free. These versatile and easy-to-use stamp sets are a great way to create beautiful and elegant cardmaking projects. To use these stamps simply peel them from the backing sheet and place onto a acrylic block (not provided) ink the stamp up and stamp. Once you are done simply peel the stamp off the acrylic block and wipe clean with an alcohol free baby wipe or wash in soapy water, leave to dry and return to the clear backing sheet. Part of the Girlfriends Collection from Art Impressions. Fran's Curio Rubber Stamps are sweet, colorful, wooden sculptures ideal for decorating your crafting area or giving to crafty friends. On the back of each, you'll find a matching rubber stamp in our finest gray rubber, closely trimmed, with black foam cushion for the Stampendous impression you've come to expect from our products. Coffee Friend measures approximately 2-3/4"w X 2-1/4"h X 1-1/8"d and stands on its own. Creative Expressions - Clear Stamp Set - Fishbowl Friends. This stamp set includes many sentiments and images that coordinate well with the Sue Wilson Fillable Fish Bowl Die set: CED21001 to make very cute cards and layouts. 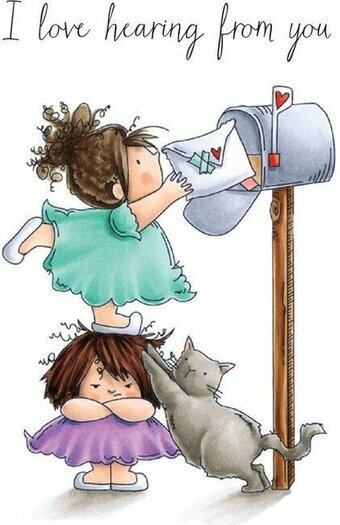 22 stamps with images and sentiments. Sizes: Smallest: 0.75" x 0.25", Largest: 2.0" x 1.90". Clear photopolymer 4" x 6" stamp set featuring a deer, a squirrel, "Just a note", "Make the world a better place", "So happy for you", "Hello Friend", "Thinking of you", and more. Cling Stamp from Impression Obsession with a friendship theme. 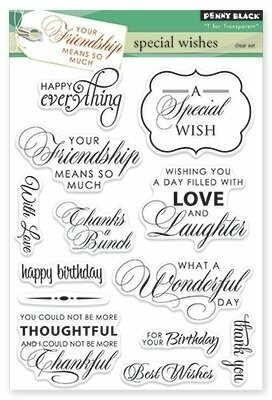 "Happy Birthday", "Hello", "Friend", "Thank You", "Thinking of You", "Missing You", "My Friend"
Cling Stamp from Impression Obsession featuring the sentiment "I Treasure Our Friendship". Cherish the special friendship of kindred spirits. This original design is copyright Laurel Burch. It is deeply etched and precision cut from premium gray rubber on a 1/8" gray rubber foam backing then mounted on a cling vinyl decal with full sized image for easier storage and use with an acrylic handle sold separately. Made in the USA. Hugs are the perfect response to almost any occasion and when puppies and kittens are involved, even more so. Feeling sad, mad, or anxious? Hug it out. Feeling happy, excited, or proud? Celebrate with a squeeze! Birdie Brown Little Buddies features two sweet boys, each hugging a cuddly friend. A bonus cat and dog image makes for a real party and the assortment of included sentiments makes this the perfect set to celebrate friendship, birthdays, and accomplishments for your little buddies. This 12 piece set includes: boys (2) 1 1/8" x 3", 1" x 2 1/8", dog 3/4" x 1", cat 1" x 7/8", If I Had a Tail, It Would Be Wagging 3 5/8" x 5/16", For My Little Buddy 2 1/4" x 5/16", Happy Barkday 1 7/8" x 5/16", You Give the Best Hugs 2 5/8" x 5/16", We'll Always Be Friends 2 1/2" x 5/16", You Make Me Happy 2" x 5/16", You're Pretty Great 2" x 5/16", I'll Always Knead You 1 3/8" x 9/16". Clear stamp sets include the name of the set on the sticker for easy identification. Our clear stamps and Die-namics are made in the USA. Penny Black clear stamps featuring lots of adorable dogs. Cling Stamp from Stamping Bella featuring travel and friendship themes. Includes the sentiment "A journey is best measured in friends rather than miles". Create cards fit for a king with the Royal Friend stamp set. Our furry friend sits in a regal throne and boasts a bejewed crown. Wave "hello" to a sweet little prince in your life with one of the two included sentiments. This 3 piece set includes: Character 1 5/8" x 2 5/8", Sentiments (2) 1 7/8" and 3" in length. Clear stamp sets include the name of the set on the sticker for easy identification. Our clear stamps and Die-namics are made in the USA. 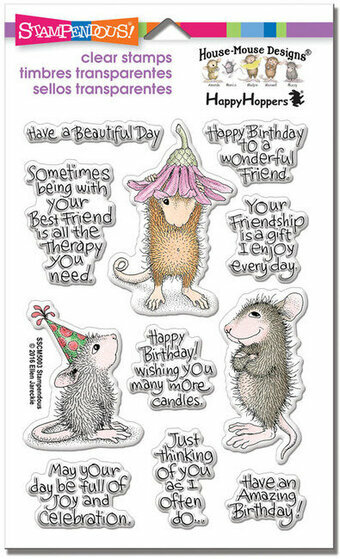 Friendship themed Penny Black clear stamps featuring mice, squirrels, a cat, and a hedgehog. Cling rubber stamp from Stamping Bella featuring a friendship theme with a girl mailing a letter. Penny Black clear stamps featuring the sentiments "Happy Everything", "Your friendship means so much", "A special wish", "With Love", "Thanks a bunch", "Wishing you a day filled with love and laughter", "Happy Birthday", "What a wonderful day", "You could not be more thoughtful and I could not be more thankful", "For your birthday", "Best Wishes", and "Thank You". The adorable Springtime Critters stamp set includes a variety of animals whose arrival signifies the arrival of spring - delightful. Their cheerful dispositions will bring a smile to your face as you create with them, and a smile to the face of the lucky recipient of your efforts. The variety of sentiments includes but punny phrases that tie to the imagery, as well as more generic greetings that will work with the set, as well as with other images in your collection.vThis 12 piece set includes: Rabbit 1 1/2" x 2", Frog 1 3/8" x 1 3/4", Turtle 1 5/8" x 1 1/8", Butterflies (2) 1 3/8" x 1/2", 3/4" x 1/2", Birds (2) 3/4" x 5/8", Sentiments (5) ranging from 2 5/8" x 3/16" (you're my best friend) to 3 1/8" x 7/16" (friends like you). Clear stamp sets include the name of the set on the sticker for easy identification. Our clear stamps and Die-namics are made in the USA. 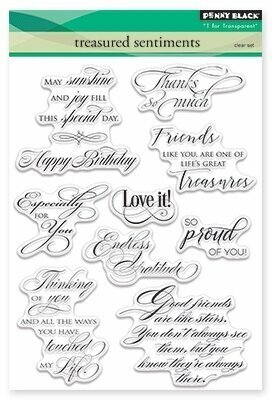 Some of our popular classic word stamps have been combined with new phrases to delight you and provide sentiments for all your needs. Includes "Sending cheerful thoughts your way", "Thank you for all the things you do", "May your day be filled with sunshine", "Thoughts of you flutter by on the breeze", "Tend a garden and beautiful flowers will appear", "Thank you", "Nurture a friend and an enduring friendship will bloom", and "You're so thoughtful, thanks for listening with your heart". Penny Black clear stamps featuring the sentiments "May sunshine and joy fill your special day - Happy Birthday", "Thanks so much", "Especially for you", "Friends like you are one of life's great treasures", "So proud of you", "Endless gratitude", "Thinking of you and all the ways you have touched my life", and "Good friends are like stars, you don't always see them but you know they're always there". 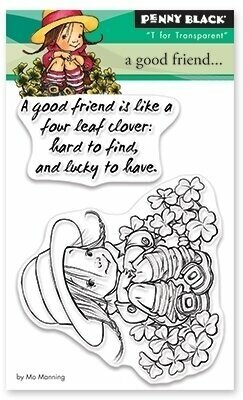 Friendship themed cling rubber stamp from Stamping Bella featuring the sentiment "A true friend is someone you can trust with all your secrets".